So one of the many things on my "MUST DO" list in Philadelphia was to settle it once and for all and see who really has the best cheesesteak, Pat's or Geno's. So this was the set up, me and the Mr set out to settle the score and he got a cheesesteak from Geno's and I got one from Pat's. We took them to Love park to do our research. We split our sandwiches in half and dug in. So here are the results. 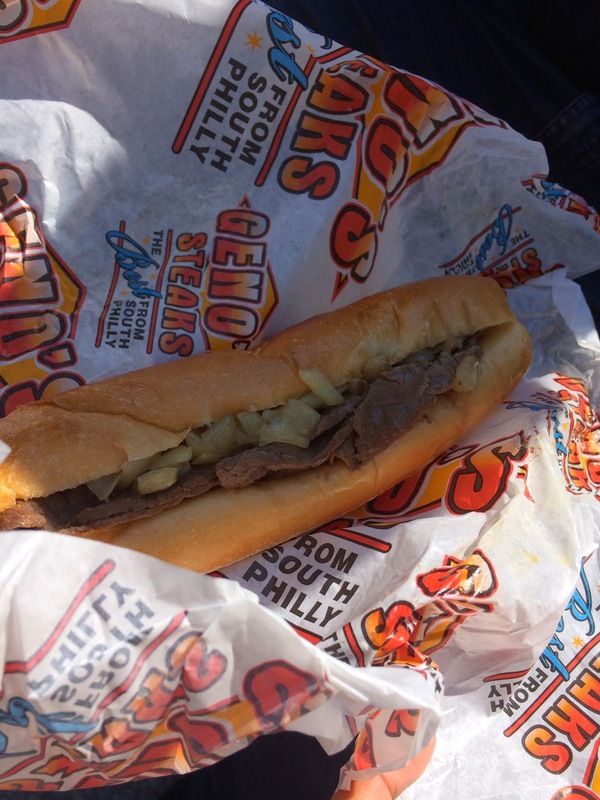 The Mr thinks that Pat's has better bread… I disagree, I am a fan of the chewier bread from Geno's. We both agree that the inside (steak, peppers, onions and cheese… not wiz, but American…couldn't really get with the thought of cheese whiz) was better at Geno's, BUT I must admit… the best cheesesteak that I had in Philly came from the Phillies ballpark after the Brewers vs Phillies game. Maybe my experience would have been different if we ate our sandwiches as soon as we got them, or if we got cheese whiz instead of american cheese but as it stands, the next time I'm in Philly, my cheesesteak will come from Citizens Bank Park.